We are pleased to announce the opening of the trail! A grant from the Birkenfeld Fund by way of the Seattle Foundation made this possible. A group of invitees were present for a ribbon-cutting, trail tour and luncheon. We offer our thanks to everyone who attended, and to all the Board members and community members who worked hard on this trail! Click here for full photo gallery on the Worthington Park website. Dipping 9,000 shingles with stain: Dip n’ Drip! Quilcene “dip and drip” event at Worthington Park… Update: IT’S GOING GREAT! 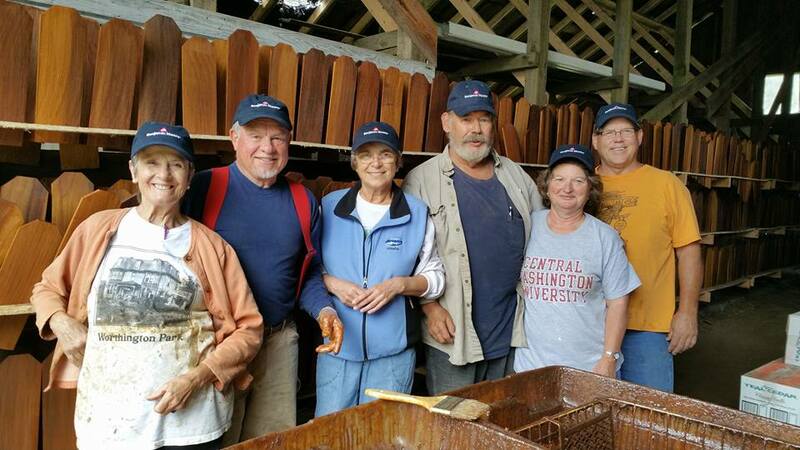 We are coating the cedar shingles which are part of the new third floor finish. The shingles need to be dipped in finish, allowed to drip momentarily, back brushed, and placed on a drying rack. We truly need volunteers to help us accomplish this goal. We have earned the bronze and now SILVER medals for dipping 2/3 of the 9000 shingles for the new mansard roof! Don’t miss out on your opportunity to be a part of the beautiful mansard roof. In the photo below: Eric and Jeremy from Nieman Construction teepeed shingles to dry for bay window roofing at Worthington House. Kathi, Carol, Marita and Cleone painted window trims for the mansard roof. Over 400 hours of volunteerism this summer! Come join us as a part of the mansion’s history. Wednesdays, Fridays and Saturdays. Oh, we will have a ‘sip’, to go with that dip and drip, after we bring in the gold medal (all 9,000 shingles are coated) and we get together for a victory party. So, on Wednesdays and Saturdays from nine a.m. to five p.m., please come by and take a one to two hour shift for this event, at the mansion. Such a deal – free parking, opportunity to meet new people, learn the skill of ‘dipping and dripping’ and bring in the ‘gold’ for the third floor mansard roof! The work needs to be done now as the good weather is our guide. Wear your paint clothes. Please call David Satterlee, the ‘dip and drip’ coordinator at 765-4810 for more information or just show up! Comments Off on Dipping 9,000 shingles with stain: Dip n’ Drip! Summer Fun at the Linger Longer Stage! Thanks to all who helped make FamilyFest 2016 a fun day for our families and friends. Check out the post on Linger Longer Productions for all the pics. Click to see more event pics! Comments Off on Summer Fun at the Linger Longer Stage! Thank you to our friends and supporters – we could not do it with out you! Please enjoy these candid shots from a very pleasant afternoon together. Admission includes five free taste tickets! Food and gift vendors will be present. Come enjoy the fruits of fine local producers 101 Brewery, Eaglemount Wine & Cider, FairWinds Winery, FinnRiver Farm & Cidery, Marrowstone Winery and NEW for 2015: The Hardware Distillery from Hoodsport! Heavily rooted in jazz, fusion, flamenco, rock, classical, blues and gypsy music his unique musical talents are equally as diverse. "Like" our page to get updates. Sign up for the News and Events email newsletter: Click here - Thank you! Not quite ready to sign up? Click here to download our most recent newsletter. A small town with a can-do attitude!